thanks for sharing. Do you mind sharing your modified flash-sources as well? I plan on making the image & flash sizes dynamically changeable and the orginal-sources produce flickering with your script. I only modified the large.swf to add the option for opening in the same window. An updated copy of the large.fla file can be found here. Good luck with your changes – It sounds like a great addition, post a link here if you manage to get it working. Thanks a lot for your demo and explication, it’s really very useful and nice. I have a question, when I download your small.swf and the big.swf files to my server, then change the small_path and big_path to local src, the peeling effect disappear. I don’t know where the problem is. Can you pls. give me more information about this? How about placement options such as the other corners of the browser, and an option of leaving the ad stay open with a close button. Those would be some other nice features. Chenlley – I’m glad you found it helpful. What path are you putting in to the peel.js file? And what folders are all of your files in? Jakes, these are some good suggestions – thanks. If I get a chance I’ll see if I can add these in to the flash file… I don’t think I’ll manage to compete with the pageear stuff, but my version is free for all uses! Hi, I’ve just tried your method out, it works great, but is there any way I can make the smaller image a bit bigger, and the large one a bit smaller? Will it be a case of scaling the 2 flash files to do it, then change their dimensions in the js script? Great script. But as with Michelle, I need the smaller image or the entire corner to be a little bigger. How do we go about doing this? Will it need an edit of the flash movies? Very cool. I have found out though, it only works if the peel.js is in the same directory as the page. SORRY, I have made a mistake! What will be with users witch have disabelt java in the browser? 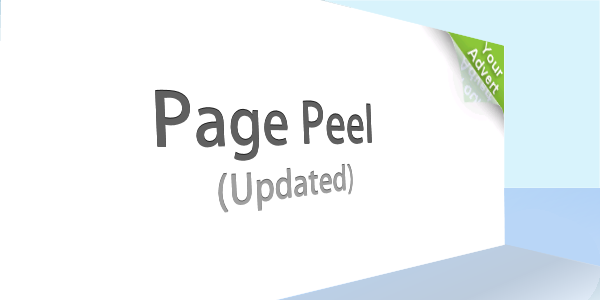 Currently the Page peel is not java based but Flash based. That means it won’t work on any IOS devices (iPhones, iPads etc. ), or newer Android devices. I have written a version of the page peel specifically for the WordPress CMS system that doesn’t require Flash, and will work in most browsers from IE7 onwards (including iPads etc.) You can purchase this plugin from CodeCanyon. I’m in the process of creating a non WordPress version of this now. If you want to find out more about this, get in touch with me via the contact form.